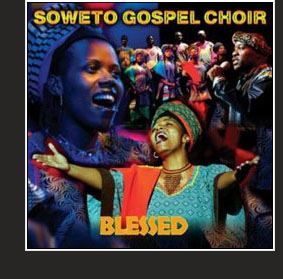 As on their now celebrated debut album, “Voices from Heaven”, this miraculous ensemble from Johannesburg’s notorious/iconic Soweto township moves between Anglican-inspired and gospel tinged hymns plus assorted home wrought styles. The selections, performed in four languages including English, are either presented in a cappella arrangements, backed by guitar band with percussion or wreathed in clapping, stomping and whistles. Soloists Sipokazi Luzipo and Vincent Jiyane are epsecial stand-outs; the latter’s performance on “Weeping” could wring tears from a stone. Other unforgettable moments include “Noyana” and “Thapelo” but it is the more well-known tunes that fully reveal the ensemble’s power to transform. “Oh Happy Day”, “Swing Down, Sweet Chariot”, “Khumbaya” and Solomon Linda’s deathless “Mbube” (aka “Wimoweh” and “The Lion Sleeps Tonight”) are resuscitated and refreshed, as is “Nkosi Sikele’iAfrika”, South Africa’s soaring national anthem. The atmosphere, while moving, is in no way or depressing. In fact, other than the awe inspiring beauty of the singing, which seems to build a rainbow bridge between this world and the next, the overwhelming impression is of upbeat courage, dignity, grace and hope. This multitalented group has exploded onto the world music scene, wowing audiences with its virtuosity and passion. Drawn primarily from the churches and communities of South Africa’s most famous township, the choir mixes earthy rhythms, rich harmonies, drumming, dancing, and irrepressible charisma for an experience that lifts the soul and stuns the senses. 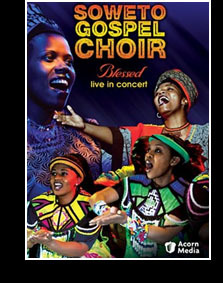 Filmed live in concert on their 2005 Australian tour, they sing a blend of traditional gospel and contemporary standards in English as well as some of the 10 other official languages of South Africa. Constantly in motion and dressed in vibrantly colored robes and textiles, with one superb soloist after another taking the lead, they offer up such highlights as “Asimbonanga,” Jonny Clegg’s tribute to Nelson Mandela; Peter Gabriel’s “Biko”; “Mbube,” the South African song that became “The Lion Sleeps Tonight”; the traditional ballad “I Bid You Goodnight”; Bob Marley’s classic “One Love”; and Nkosi Sikelel’iAfrika, the South African National Anthem.